When you join a Lync meeting you can decide which type of audio to use and depending on your choice, you’ll have different options and audio controls. To transfer a call to someone else, click the Transfer Call tab, and choose a contact to transfer the call to. 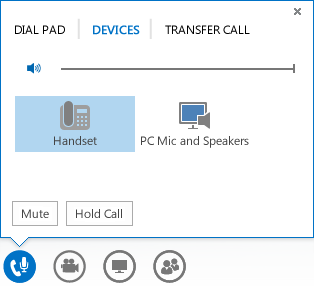 Click the Dial Pad tab to interact with the phone systems, such as entering a code when you call your voice mailbox, if voice mail is available. If you used the Call me feature (Lync calls you) or dialed in to the meeting audio with a phone, press *1 on your phone key pad to access the meeting help system. You can control your audio with the touch-tone commands, such as mute, unmute, and other commands. Note: You can have Lync call you and set up meetings that include call-in details only if your account is set up for dial-in conferencing. For details about this setting, contact your workplace technical support.